A good chopping board is an essential addition to any kitchen, protecting not only your work surfaces and fingers but also your food from unwanted contamination and bugs. From carving that turkey for a delicious Sunday roast and chopping veg to serving the cheese selection at the end of the night, the right chopping board will see you right. But what constitutes a good kitchen chopping board is more than just a tough cutting surface, it needs to be scratch-resistant and knife-friendly, hardwearing and easy to clean. Hardwood, bamboo or plastic, the choice is yours. Wood and bamboo are smooth surfaces for a good-looking and hardwearing chopping board that repels germs and gives them nowhere to hide. Plastic is durable and easier to clean but can scratch over time. Multi-chopping boards sets also offer good value for money and enable you to follow the separate boards for different food group rules. Gear Hungry has put together a list of what we think are currently the best chopping boards out there to help you get ahead. We’ve looked at price, materials, design, and durability to help you to choose the right chopping board that really is a cut above the rest. Bamboo is the sustainable buzz-product of the moment and is perfectly suited to the demands of a good quality cutting board. And with this great value set from Totally Bamboo, you get three boards into the bargain, making this lovely three-piece chopping board set our review’s Best Choice. And the best choice title is well-deserved. This is the perfect starter chopping board set that that would not only look great on your own kitchen work surface but makes a top wedding housewarming gift too. So, what’s the deal with bamboo and why is it so good for chopping your meat or veg on? Well, firstly it is sustainable and is grown organically without the need for nasty pesticides or artificial irrigation. It also releases more oxygen than a similar sized tree and can be harvested 14 times during the time it takes for a single hardwood tree to mature, according to the board’s makers, Totally Bamboo. Seriously good eco-credentials then. But it doesn’t stop there. Bamboo is also an ideal hardwearing material for using in the kitchen. It’s a tough cookie, harder than maple and even has a higher tensile strength than steel, making it a long-lasting product to keep around the home. And it is kinder on your sharp knives than plastic and is super easy to clean. 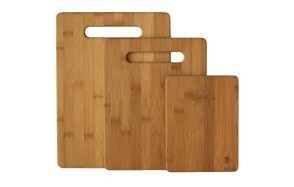 This Totally Bamboo three-chopping board set offers fantastic value for money too. For less than $10, you get a carving board for all your cooking, dicing and chopping needs. First, the 13-inch large chopping board is the go-to for slicing meat, fish, and veg. Reversible, it allows you to chop cooked meat on one side, and raw meat safely on the other. Then opt for the great-sized 11-inch fruit and vegetable cutting board before dropping down to the mini eight-inch chopping board for the fiddly garnish bits and cutting sandwiches. We love these cutting boards and think the style and finish of the bamboo are rather smart. For all-around, day-to-day use, you can’t really go wrong with this awesome little chopping board set. This cutting board from NYC-based cooking utensil innovators OXO is a total workhorse of a chopping board that you are going to be more than happy to have on your side when the going in the kitchen gets tough! Crafted from non-porous, odor-resistant and super-durable polypropylene plastic, this carving board is sturdy enough for both domestic and professional use, day after day. It’s a great size at a good price and is styled confidently enough to make you feel this is the only cutting board you’ll need for all occasions. The polypropylene used for this chopping board is not only scratch-resistant but is also safe for your kitchen knives as it won’t dull the blades. The Good Grips moniker comes from the board’s non-slip edging that grips the kitchen counter in the wet, while also doubling up as comfy grip handles for carrying. One side of the chopping board features a perimeter groove to keep all those meat juices contained while the flip side is smooth and perfect for non-meat items to prevent cross-contamination. The OXO Good Grips is particularly suited to kitchens where work surface space is limited as it stores away easily, in a drawer or at the counter side and is totally safe in the dishwasher. There are also larger sizes available. For day-to-day cooking, chopping, and cutting, this could well be the only plastic carving board you need. If a non-slip surface is one of your priorities when it comes to choosing the best chopping board set, then the Gorilla Grip reversible cutting board will not leave you disappointed. A three-piece set for around $20, these kitchen chopping boards are great value for money and with three different sizes, they are extremely versatile too. Makers Gorilla Grip have gone for thick – a quarter of an inch to be precise – and strong with this product, and as a result, the chopping boards look and feel substantial on the kitchen worktop. These chopping boards are non-porous and made from BPA-free plastic, so they won’t buckle or groove over time and can be put into the dishwasher time and time again. The thick edging and handles give these cutting boards their non-slip surface grip and a deep groove around the board edge collects all that run-off liquids and juice. The surface of these tough chopping boards is resistant to scratches and won’t dull the edge of your electric knife, so makes them perfect for chopping vegetables and meats or for serving cheese. So confident are Gorilla Grip that this chopping board set will perform time and time again, that it comes with a 10-year Gripping Properties guarantee. Coming in at around $130, this is an investment wooden chopping board made from the most beautiful maple, but it is much more than just simple kitchen eye candy. John Boos Cutting Board is by far the thickest cutting board in our 10 best chopping boards review and is a solid addition to your hardwearing kitchen gadget and utensil collection. It is also a lovely old school design – as the old adage goes, if it isn’t broken, don’t fix it! Solid and coming in at a super-sized 24 x 18 inches, it can take any large joint of meat for carving in its stride but is just as good for fruit, vegetables, cheese, and bread. It is big enough for both the cheese and your cheese knives. 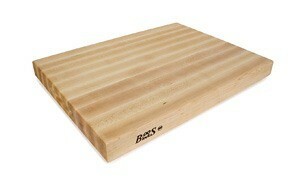 This makes it a great chopping board for Thanksgiving and the Christmas holidays. This large chopping board from John Boos is also reversible, so good for keeping food products separate but its sheer volume means it does come in on the rather heavy side. However, there are end handgrips which make it easier to maneuver around the work surface as well as to lift and carry. Renowned for their butcher’s blocks, John Boos have put all their expertise into this domestic carving board that would look great on any kitchen work surface. And despite its size, its functional good looks are also easy to maintain. It’s maple wood just needs simple handwashing and occasional oiling to keep it in tip-top chopping board condition. It also comes in equally attractive and hardwearing cherry wood. Looked after and this quality cutting board will be with you for years. 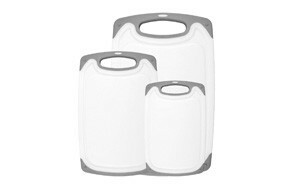 Give any kitchen bacteria the short-shrift with this bumper value Three Chopping Board Set from HOMWE. Made from sturdy BPA-free plastic, these cutting boards are tough enough to withstand the hardest of chopping, carving and dicing without scratch damage – preventing any pesky bacteria from taking hold. There are three useful sizes in this chopping board set, with the largest board measuring a decent 15.7 inches by 9.5 inches, that’s plenty of room for a large roast bird or joint of meat. With sufficiently deep grooves around the edge of each cutting board, juices and sticky liquid are given plenty of chance to run off, keeping the main chopping board surface clear. And the end handles are designed to give plenty of room for even the largest of fingers to take hold, making transporting these chopping boards easy and safe. The handles also create non-slip traction when the chopping boards are placed on a flat kitchen surface for extra security when carving. One of our best chopping boards, this set is also dishwasher safe and cleans up a treat, meaning you get plenty of carving board life for your buck before needing to change. A perfect gift for foodies in your life. For a price starting at just shy of $60, with the Joseph Joseph Index cutting board set, you get a pack of chopping boards that actually wouldn’t look out of place in an office. With its index card box style design, this clever box of chopping boards gives you a color-coded selection of four chopping boards to prevent the dreaded food cross-contamination. For the price, you get four large plastic chopping boards, one for each food type, making this set good value for the serious cook. 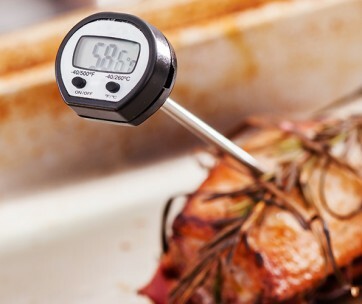 And if you are in any doubt, each board has an index-style tab to clearly show what it should be used for – whether it’s raw meat, raw fish, vegetables or cooked food. 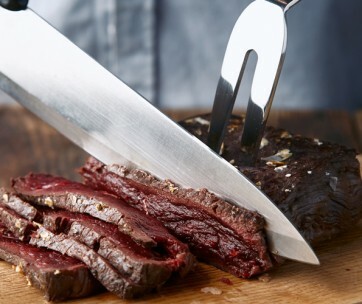 Each sturdy chopping board provides a knife-friendly surface to keep your steak knives protected, with a crumb and juice catching the edge as well as non-slip feet to keep things secure where they need to be on the work surface. The solid index box also provides a neat tidy away when you’ve finished and can fit in a corner or a cupboard for easy storing. They are not the thickest or sturdiest boards in this review, but each cutting board is a more than adequate 13.25 inches x 9.5 inches in size and are totally dishwasher safe. At first glance, you’d be forgiven for thinking that the Chop2Pot looks more like a shovel than a chopping board, but don’t be fooled, this is a cracking and not so little cutting board from Joseph Joseph. But why, you may ask, does it have such a quirky scoop design? It’s a simple but creative solution to that chop to pot spill we’ve all encountered when tipping chopped food into the pan. Secure the award-winning Chop2Pot cutting board to the kitchen worksurface and dice your veg or meat. Once done, squeeze the top of the handle and the sides of the board fold will in like origami, to create a ‘chute’ to cleanly guide the chopped food (or waste). Simple, no spill! But how does it perform as an actual cutting board? Pretty damn well actually. With non-slip feet, this bendy board can be secured flat and solid onto the kitchen work-top and its knife-friendly cutting surface is the ideal platform for efficient food chopping and carving. When ready, squeeze the handle and the polypropylene hinges kick into action to create the chute. The Chop2Pot doesn’t scrimp on size either and comes in two good sizes – 15 x 8.75 inches or a very generous 19 x 10.75 inches – which are both tough and dishwasher safe. And finally, this ingenious chopping board is sensibly priced so for your $20 or less, you get a lot of design for your money. It makes a perfect Christmas gift for any cooking enthusiast. Is your chopping board pet hate all the peelings and mess left behind after you have cut your food? Well you, my friend, could benefit from the Over the Sink cutting board from Good Cooking to keep your chopping neat and on track. It sounds complicated, but it isn’t and with its clever multi-features, you will soon wonder how you lived without it. At first sight, this is an ordinary sized, standard use chopping board with a removable silicone colander to collect waste for disposal or your chopped food for easy rinse. But if counter space is also an issue, then pop out this super chopping board’s extended section to rest it over your sink and voila, you have the extra space and support to make light work of your dicing. The extension is designed to fit over most standard sized sinks and the silicon edging on both ends prevents it from slipping. And the food collecting colander is also collapsible too, so great for easy storing. Is there anything they didn’t think of? As one of our review’s best chopping boards, this Good Cooking product performs well too and is made from food grade polypropylene which is BPA and phthalate free. It is also knife friendly and is totally dishwasher safe, so quick and easy to clean. Phew…and all for less than £30. Now, that’s a bargain. Go over to the dark side with this mess-forgiving chopping board set with a black marble appearance and super tough design. Made in three handy sizes, with the maximum giving 15 x 10 inches of chopping space, this antibacterial Plastic Kitchen Chopping Board Set from Sunpollo is a really practical as well as eye-catching addition, especially in smaller kitchens. Made from FDA approved environmental protection PP plastic and a hard surface that deflects scratches while being kind to even the sharpest of your knives, you get a versatile chopping board set for your money. With an ‘anti-skid’ design via a rubberized full board edging, each cutting board will sit securely on your work surface as you chop and dice. You also have a choice of sides, with one side providing a decent sized ‘juice groove’ perimeter channel to catch that meaty liquid run off while the other is totally flat for vegetables, cheese and fruit. The smallest board is on the mini side but it can also be used to serve garnish and olives etc at the table, and the middle-sized board is also great for cheese. These easy to use cutting boards are also super easy to clean, just rinse with warm water after every use or pop into the dishwasher for fuss-free hygiene. Dark, mean and moody yes, but these carving boards also make light work of everyday chopping! 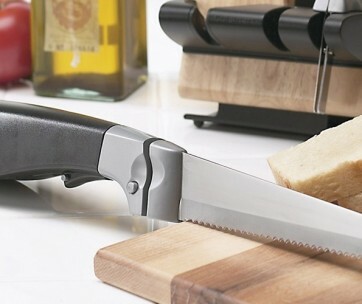 Be sure to also check our guide to the best mandoline slicers for more great kitchen products. The final cutting board to make our top 10 best chopping boards list is far too good to keep hidden behind closed doors in the kitchen – you can also make this beauty a guest at the dinner table! Made from stunning organic bamboo for a super smooth finish, this HHXRISE Venfon Cutting Board is extra-large to take all manner of meat, joints, bread, fruit, and vegetables yet are resistant to unwanted microbes and bacteria that can live in the kitchen. A sturdy animal, this popular bamboo chopping board performs well in the kitchen to chop and dice your meat and veg but can then easily double up as a food platter, so you can make the most of the three built-in compartments for example, for your antipasto, dips or cooking condiments. Around the central chopping space is a deep groove ‘juice catcher’ to trap any meat liquid and despite its weight, the smooth edges make the whole cutting board easy to carry. And finally, the smooth bamboo makes the surface kind to your cutlery and it won’t dull even your sharpest of knives. All-in-all a stunner of a chopping board that’s also super versatile, making it the perfect board to show off when your guests come around.